Have you ever wondered why you feel hungry a short while after having a feed full of carbs? You are full straight away, but an hour or two later you are looking for a snack to tide you over until the next meal. This is believed to occur because of the body's reaction to a big intake of carbohydrates. The carbs are quickly absorbed into the blood stream sending your Blood Glucose levels sky high. Then over the next few hours your levels drop. They drop so far that they go below the normal recommended levels, then slowly rise back up. This occurs over a 6 hour period (around the same time you are ready for your next meal). The problem is, while your blood sugar levels are dropping down after the carb rush, your hunger starts to kick in. This usually occurs between 1 and 4 hours after eating a high carb meal. Dr Andreas Eenfeldt (The Food Revolution video) performed his own tests on himself regarding blood glucose levels (see attached image). 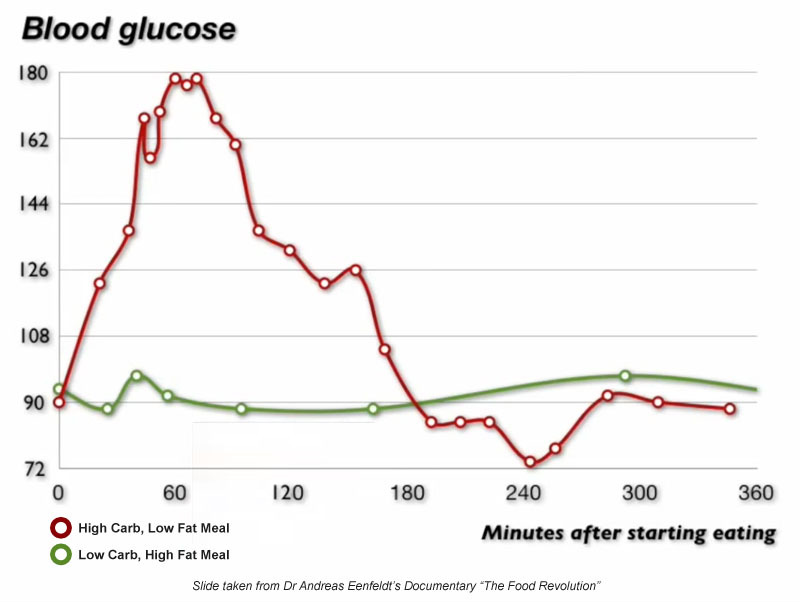 He recorded his blood sugar levels over a 6 hour period after eating two completely different kinds of meals. Meal 1 : Piece of non-lean steak and veggies (all fried in butter) with Bernaise sauce (egg yolk and butter sauce). Meal 2* : Tuna sandwich, apple, tub of yoghurt, a chocolate bar and a bottle of water. * This meal was provided to doctors at the International Conference on Obesity 2010 in Sweden.... Go figure! 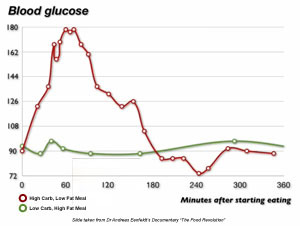 As you can see by the graph (Click the thumbnail to see a larger version), Meal 1 (the Low Carb, High Fat meal) kept his blood sugar at a steady, even level, right where it should be. Meal 2 (the High Carb meal) sent his blood sugars *skyrocketing* off the chart over the first hour, then over the next 3 hours they drastically dropped to very low levels before slowly climbing back up to a normal level..... Ready for the next meal to have the body go through that whole blood sugar rollercoaster ride again. 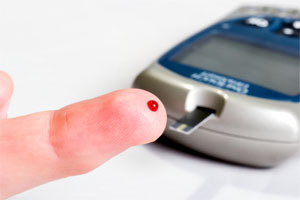 Diabetics around the world are experiencing fantastic results with this way of eating. To quote Diabetes.co.uk, "The diet [LCHF], because of its low requirement for insulin, has been recognised by the Swedish government as being suitable for people with type 2 diabetes and as helpful to individuals looking to lose weight or maintain a healthy weight.". These are some of the reasons there is a swing in the medical profession (those who are still not completely set in their ways, or not willing to deviate from the current nutrition beliefs) towards a Low Carb, High Fat food lifestyle. Video: The Food Revolution : Found in the Videos page on the Edify website. Click the link. Diabetes.co.uk : The UK Diabetes Community promotes Low Carb High Fat as a healthy choice for diabetics. Book: Diabetes? No Thanks! by Dr Lars-Erik Litsfeldt: Subtitled "The Scandinavian Diet that alleviates Diabetes"
** Note : Along with our standard Disclaimer, we advise everyone considering a LCHF lifestyle to consult your doctor first, especially if you are diabetic or have any medical condition.